Shark cage diving Cape Town is a must-do. There are two shark area’s: Gansbaai and Simon’s Town. Book now for thrilling experience! Shark Cage Diving is an experience of a lifetime. And we offer that shark cage diving experience! Book with us in Gansbaai, Cape Town. 2.5 to 3 Hours at sea. 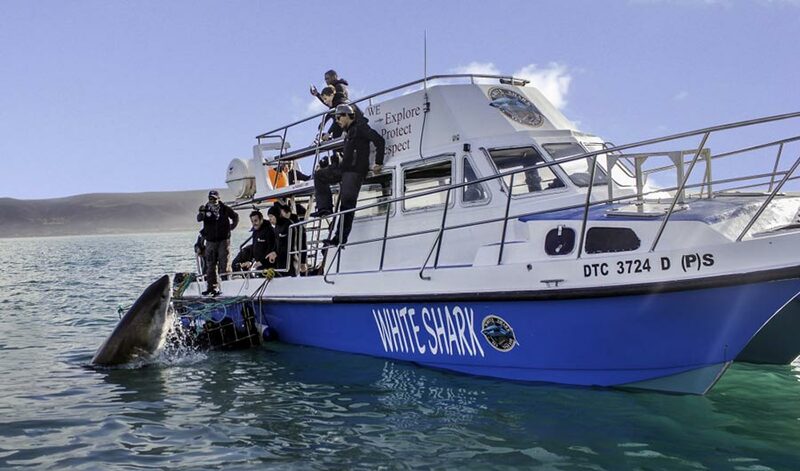 Shark cage diving in Gansbaai – A scenic 2.5 hrs from Cape Town, is done in a narrow channel called Shark Alley, which is the open stretch of water between Dyer Island and Geyser Rock. Being a leader in the industry and knowing all the in’s and out’s, is where we come in, and take the hassle out of your booking. As there are 9 other operators in Gansbaai (some reputable and others not so much) it can be confusing as to which is the best company to book with as they all claim to be “the best”. We only work with operators who have an eco-friendly approach to the ocean and its marine life, leaving a small a carbon footprint in Gansbaai as well. Should you not see a shark, you will receive either a discount or a voucher for another trip. 12.30. Return back to Gansbaai harbour and transfer back to facilities. All above information is for cage diving in Gansbaai only and not our False Bay shark trips.